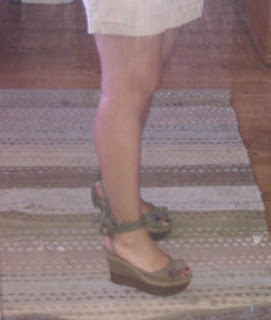 I have been ALL about the wedges this summer. While I have decent selection in my current Working Girl’s Shoe Closet, I have had the urge to add a little flair to the mix. Sadly, with this recession that’s lasting longer than that bad Tijuana hangover in college, the shoe funds must be spent more mindfully these days. I was absolutely thrilled to find my reminder from Decades Two of their biannual shoe sale! For those of you not familiar with or, sadly, far from LA, Decades Two is a designer consignment shop with a very discriminated stock of very well cared for second hand items. The shoes they take are virtually pristine. The shoes are fully scrubbed and resoled in a way that really makes you do a double take on them being used. In many instances, there are some items that have never been worn, which makes it a phenomenal find. This particular sale is twice a year that sells everything pretty much at $150…. Yes, ladies, you read that right… Louboutins, Manolos, Gucci, Prada, D&G, Choos, Zanotis, you name it, $150. So you know that you have to get there at the latest at 6 am to get in line for the 9 am cracking open of the doors. If you are a hard to find size, you get to sleep in since those are the shoes that are still there around 10 am. You're such a nifty shoe shopper!! Love them!